This original, artful K Kane bracelet is the perfect present to celebrate a new last name or a milestone birthdayfor yourself or the one you love. Designed by hand and cut with lasers for fluidity and accuracy, this personal piece is ideal for becoming a signature look. Solid sterling silver with a rhodium plated finish to brighten and help prevent tarnishing. 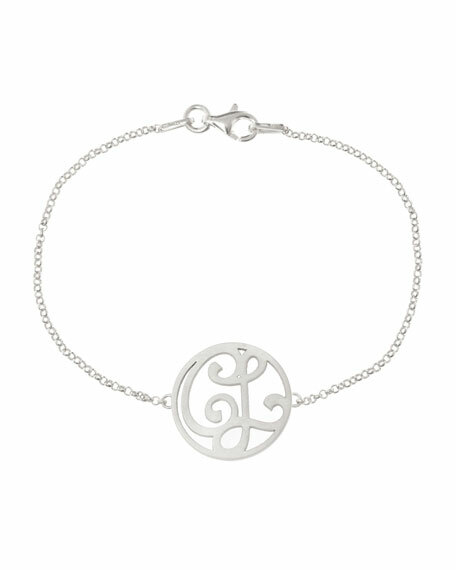 Circular pendant features two custom drawn, not computer generated, initials. Small chain bracelet, 6 1/2"L.
Alex and Ani cuff with heart-shaped ends. Polished sterling silver wire hardware. Split opening for slip-on style. Made in USA. Gorjana adjustable beaded bracelet from the Power Gemstones Collection. Polished silvertone plated brass hardware; knotted nylon cord. Petite faceted, round pyrite beads. Natural color variance may occur. Curved, hammered bar at center. Pull-through slide closure. Approx. 9"L; 2"L bar. Imported. Ippolita folded bangle from the Classico Collection. Signature hand-hammered sterling silver hardware. Five folded rows with white diamond pavé. 0.53 total diamond carat weight. Split opening eases dress. Approx. 7.5" circ. Slip-on style.